The West Coast Haunters Convention is the longest running convention for Home Haunters, Professional Haunters, and Halloween Fanatics on the West Coast. Located in Portland, Oregon at the Lloyd Center inside the Hilton Doubletree Hotel. The dates for 2016 are April 29th through May 1st. The WCHC is at year seven and Ed Roberts doesn’t plan on slowing down anytime soon. 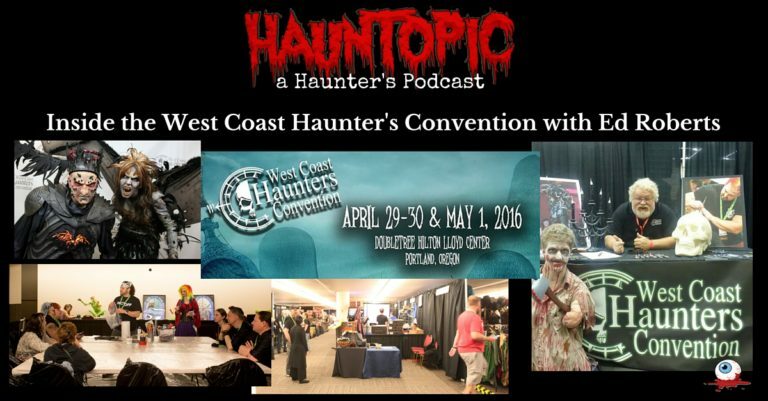 In this episode of HaunTopic Radio, we get Ed Roberts on the Haunt Line to chat about the new things for the West Coast Haunters Convention in 2016, the projects going on at the Nightmare Factory, and how escape rooms are changing the haunted attraction industry. We also announce our partnership with the Haunted Attraction Network and how you can listen to other podcasts related to the haunt industry with a different point of view. Skip forward to the end of the podcast to listen to Scene 5 of The Night Keep: Heretica plus hear a few tunes from The Night Keep through the episode. The back story to this music is getting pretty scary. Make sure to go back and listen to the past 4 podcasts to start at the beginning. Bottom Line: If you’re a Haunter and live close to Oregon, or have means to get there, the West Coast Haunters Convention is definitely a place to stay for a few days. Take advantage of the haunt education, nighttime activity, trade show floor, and everything else the WCHC has to offer. And shoot Ed with a few foam darts for us when you see him. Please? ?